Since 1972, 1736 Family Crisis Center has responded to the growing needs of victims of domestic violence, runaway and homeless youth, victims of human trafficking, homeless families, homeless and at-risk Veterans, unemployed adults and youth, and other low-income community members in need of assistance. We are dedicated to providing comprehensive rehabilitative programs that are managed by licensed therapists, social workers, attorneys and other professional staff. Men, women, children and families can access life-saving support 24 hours a day through five shelters, five community service centers, various community-based offices and co-locations and five crisis and suicide hotlines. We are ready to help kids, families, and Veterans so that they can permanently escape the worst possible conditions of poverty, homelessness and violence. A special event was held on Monday, April 30 at LAPD Harbor Division Station in San Pedro. 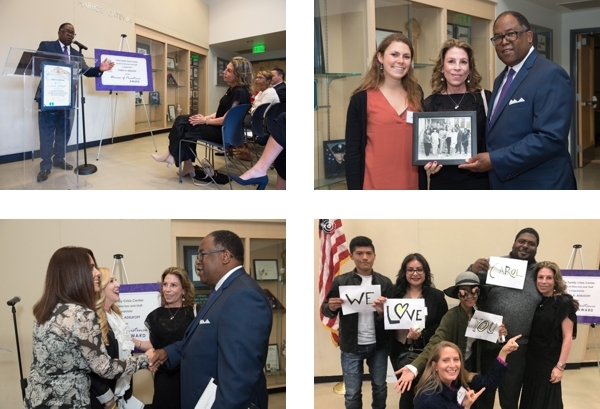 The event honored 1736 Family Crisis Center’s CEO, Carol Adelkoff, a 2018 recipient of the Woman of Persistence Award from the League of California Cities Women’s Caucus for her dedicated service, commitment, and advocacy for victims of domestic violence, human trafficking, child abuse and sexual assault; runaway, homeless youth; and all vulnerable community members, including homeless families and Veterans. The program included opening remarks by Senior Directors, Tobi Quintiliani and Debbie Nelson, 1736 Board President, Robert Smith, and Board President Emeritus, Ron Troupe. Special guests included LA County Supervisor, Mark Ridley-Thomas, LA City Councilmember, Joe Buscaino, Chanel Smith from the Office of LA City Mayor Eric Garcetti, Beatriz Dieringer, LA County District's Attorney's Office, Tiffany Rau and Olga Chavez from Andeavor Government and Public Affairs Department, Captain Michael Oreb, LAPD - Harbor Division, Carol Adelkoff, CEO and Executive Director 1736 Family Crisis Center, EIleen's Foundation and Jolyn, a survivor of domestic violence. The award program was followed by a Candlelight Ceremony to honor victims of domestic violence, human trafficking, child abuse, and sexual assault. 1736 Family Crisis Center, in its role as the LAPD Harbor Division's DART Provider, hosted this special ceremony honoring the brave survivors of abuse along with Andeavor, and other community partners who make this help possible. Go to our Facebook album to see more photos. March 15, 2017, (LOS ANGELES) – The Tesoro Foundation awarded 1736 Family Crisis Center (1736 FCC) a Public Safety Grant of $300,000 to promote a safer community through the expansion of a Domestic Violence Outreach, Training and Prevention Program in greater Los Angeles. 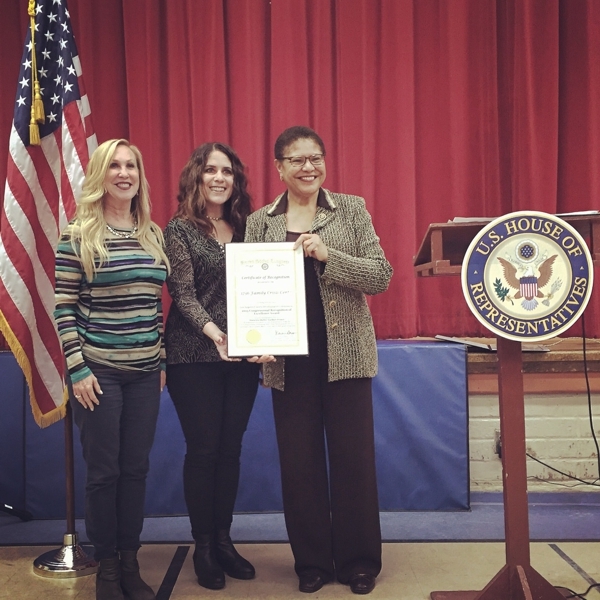 On March 7, 2016, U.S. Congressmember Karen Bass presented 1736 Family Crisis Center with the 2015 Congressional Recognition of Excellence Award. The award recognizes projects or programs that demonstrate the impact that federal Community Development Block Grant (CDBG) funds have on low-income residents and communities in Los Angeles County. 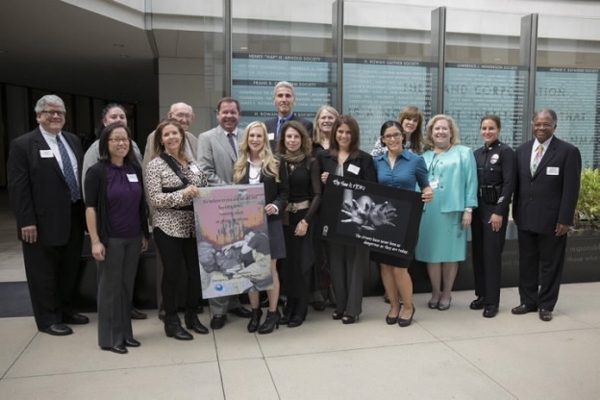 1736 FCC’s life-saving work with victims of domestic violence was nominated for the award by the Los Angeles County Community Development Commission. Below is a picture from the award presentation. In October 2014, 1736 Family Crisis Center was selected by the Everychild Foundation for its prestigious one-and-only 2014 grant. 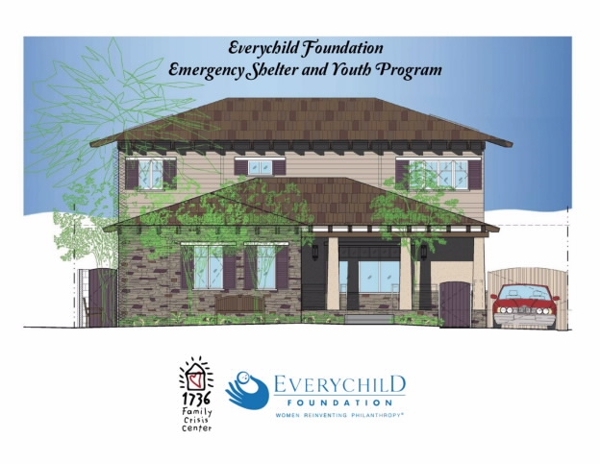 The $1 million capital award will be used to build the Everychild Foundation Emergency Shelter and Youth Program for homeless and at-risk youth in Los Angeles County. The grant will provide capital to renovate a property 1736 Family Crisis Center owns and create a larger, more versatile facility for its successful 42-year-old emergency shelter program, which serves homeless, runaway and abused youth ages 10-17. When completed, the new facility will offer safe temporary shelter for homeless youth, and a new, adjacent Youth Empowerment Center that will provide crisis intervention services and educational, job training, life skills, outreach and leadership activities for shelter residents and at-risk community youth. The Everychild Foundation makes one grant per year to a Los Angeles area non-profit agency benefitting children and youth. As an Amazon Smile partner, a portion of all sales is donated to 1736 when shoppers enter Amazon through our special web address. Click on the above link to get started and bookmark the link for future use.